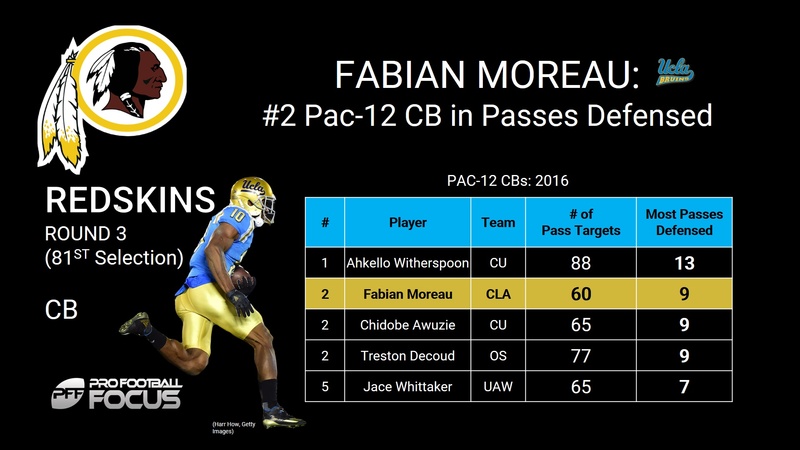 With the 81st overall selection in the NFL draft, the Washington Redskins selected defensive back Fabian Moreau out of UCLA. Moreau was a standout performer at his pro day, posting outstanding numbers in the 40-yard dash (4.35) and broad jump (136 inches). Moreau allowed 0.86 yards per cover snap last season that tied for second-best among all draft-eligible Pac-12 CBs. Moreau allowed a reception for every 13.6 cover snaps. That ranked fourth among draft-eligible Pac-12 CBs.